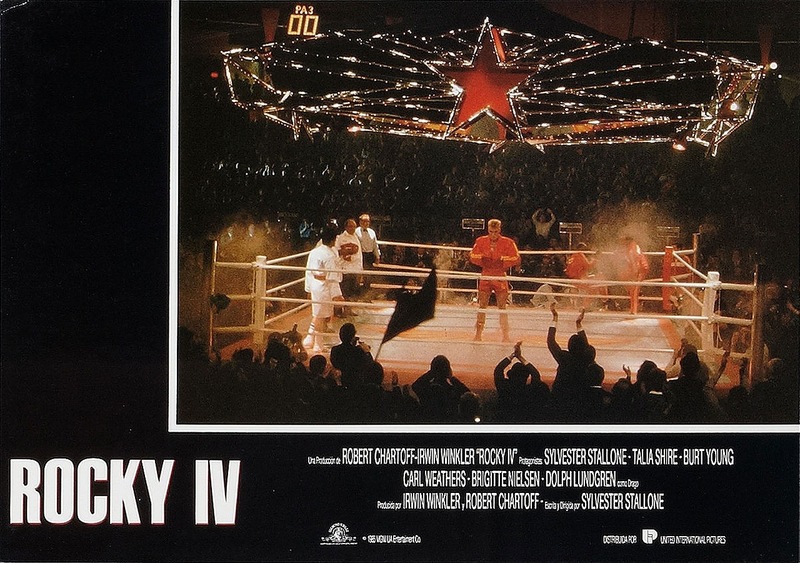 Released in 1985 Rocky IV kind of lacks everything that made the original such a truly great film. 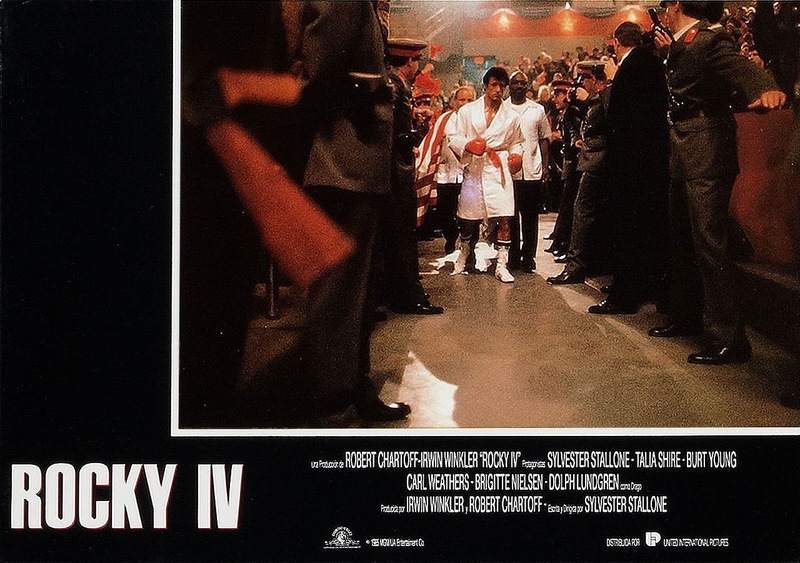 By this point in the series the Rocky films were a little more Hollywood stylized, which started in Rocky III and even though the odds are stacked against Rocky (Stallone) we all know what the final outcome will be, but with that said Rocky IV is a great film in its own right. It’s not great like the original, but what makes Sly Stallone such a great filmmaker is he knows what his audience wants and with Rocky IV he very much delivers that. 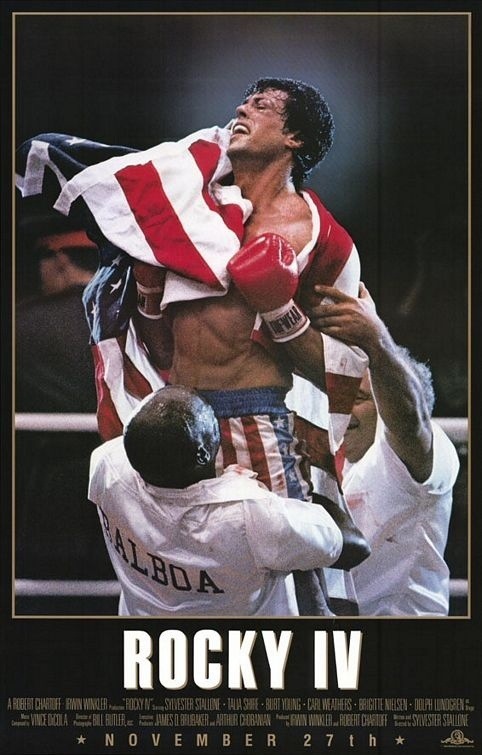 Rocky IV is a really quick paced film and its just so entertaining it elevates the film to greatness even if again not great in the traditional sense like the original. In someways starting with the 3rd they sort of became comic book movies in a way. You got the hero and the villain. 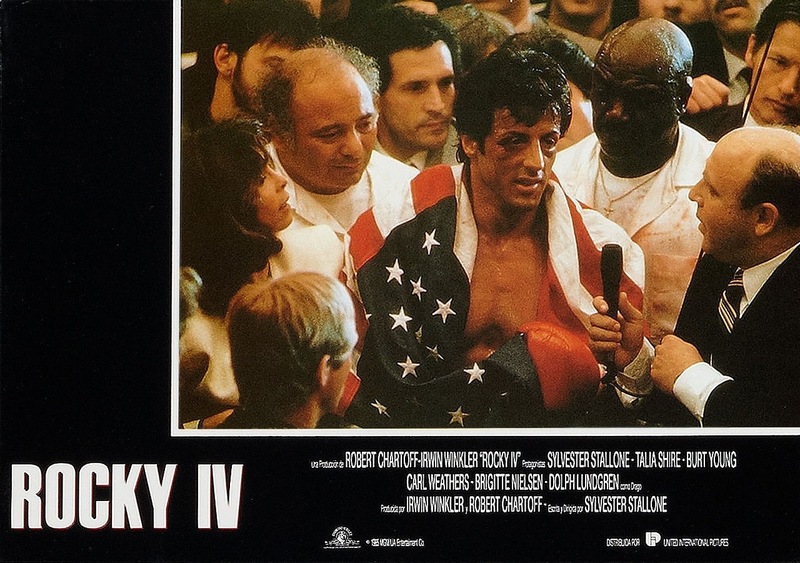 At this point of the series there really wasn’t much of a story left to tell and while Rocky II and III perhaps weren’t needed they did at least have a point. Even if this film lacks in story again its made up for in pure entertainment. 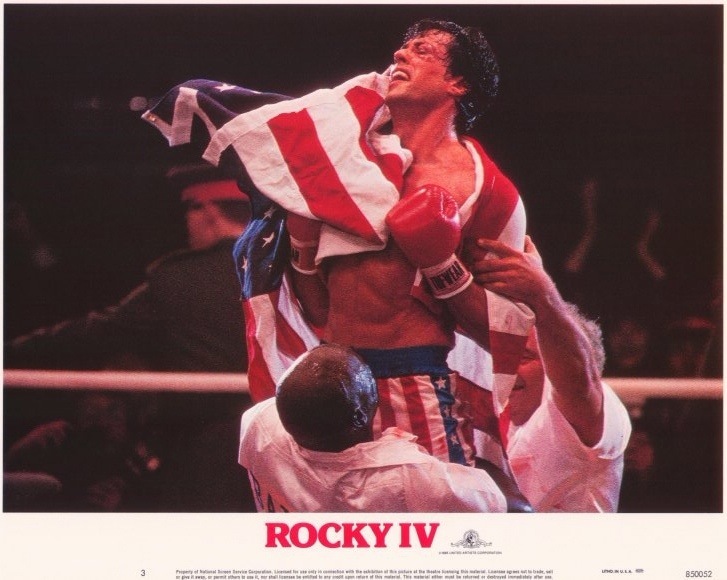 Also by this point the series was even more popular as Rocky III became the highest grossing of the series until Rocky IV, which still remains the highest grossing of the series with an incredible 127-million dollars and remember this was in 1985 so that would be far more today. 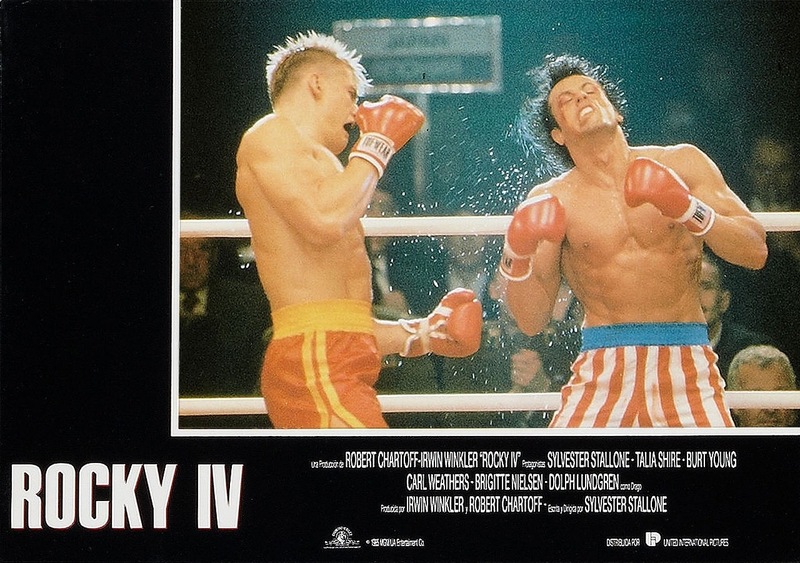 The original is by many considered the best of the series and rightfully so, but there are a lot of people who cite Rocky IV as the best and I can sort of see why. 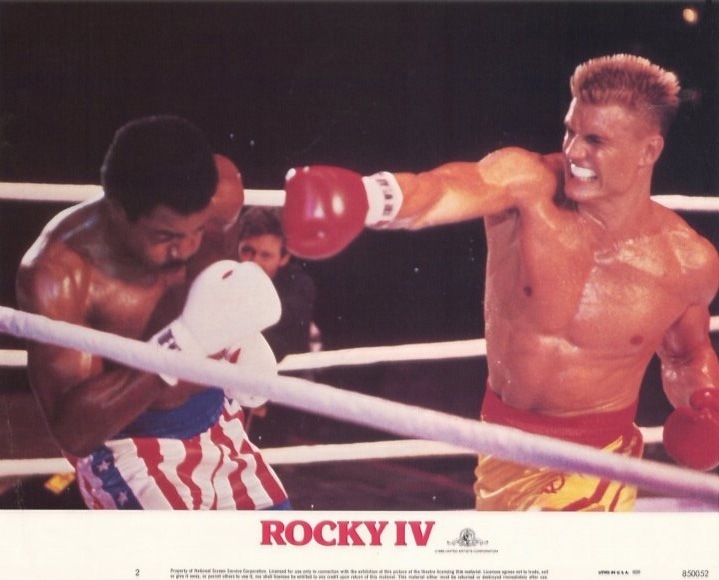 To me the original will always be the best, but Rocky IV is a really fun film. I remember seeing this in cinema when I was 5-years old and while my memory is vague I loved it back than and that holds up to this day. 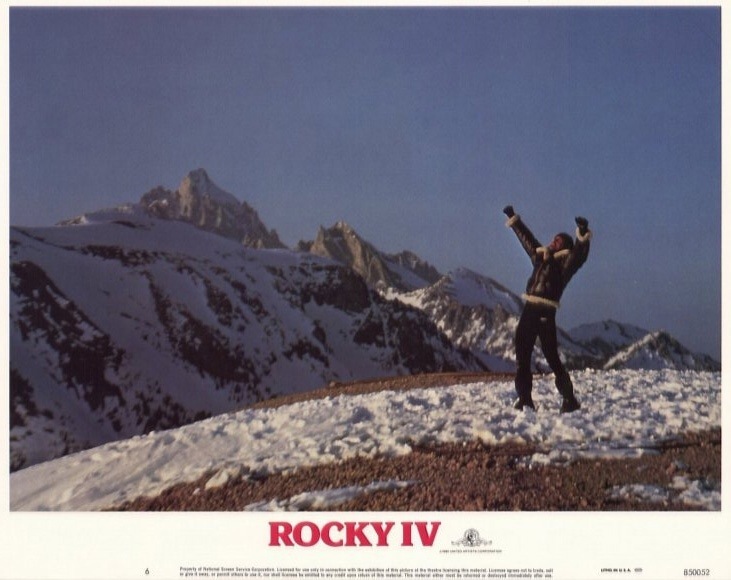 I enjoy all the Rocky films on some level and the 3rd would probably be my least favorite. While a fun film it was a little silly at times and while the writing strong it also seemed a little forced. 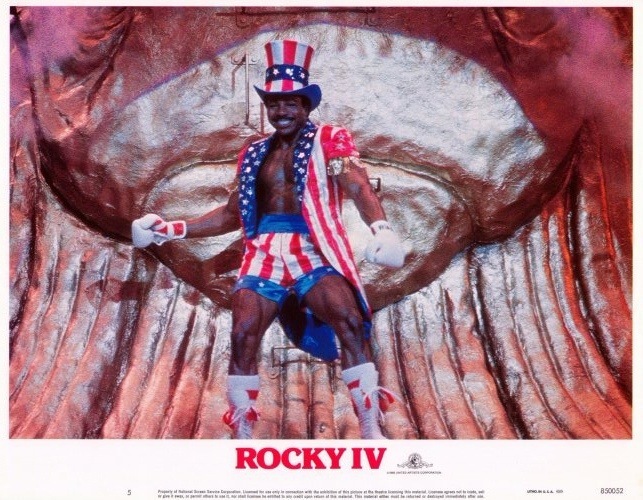 Rocky IV is also a little over the top, but generally flows better. Like the 3rd this was also a product of its time and what’s an 80s film without a montage? Here we get a couple of montages plus the scene with James Brown I’d say at least 12-15-minutes worth of the 90-minute running time is filled with music. Soviet fighter Ivan Drago (Lundgren) decides to come to America and enter the world of boxing. Apollo (Weathers) retired for 5-years challenges Drago to an exhibition fight. Rocky tries to talk Apollo out of it, but he won’t listen. As the fight starts Apollo looks good, but Drago is too young and powerful for the older Apollo and he soon gets pounded on. 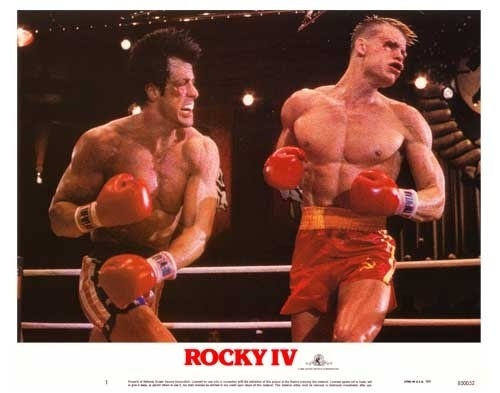 Rocky wants to stop the fight, but Apollo refuses and when the 2nd round starts, Drago continues to punish Apollo and with one big blow ends up killing him. 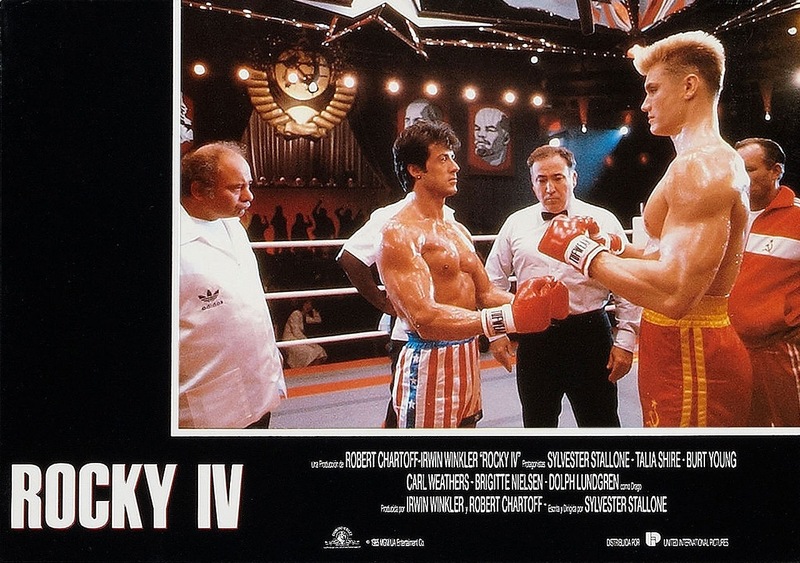 Looking to avenge his friend, Rocky sets up a match against Drago, which will be held on Christmas and in Russia. 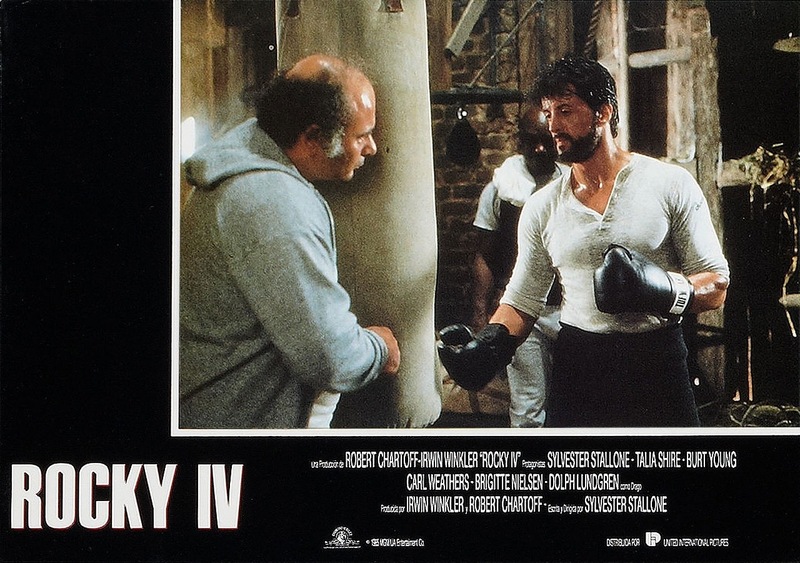 The screenplay by Stallone pretty much lacks everything that made the original such a great film, but with that said Sly still writes a really fun script. 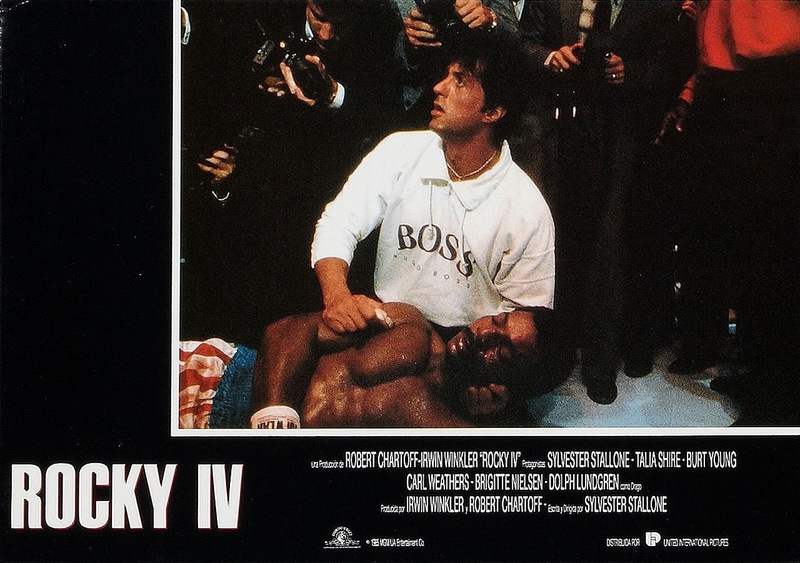 Even though Sly stacks the odds against Rocky we all know what the final outcome will be as by now the underdog story is gone, which is no fault of Sly as a writer, but it does hinder the script just a little bit. There are certain scenes that are perhaps a little over dramatic and even a little sappy, but Sly is such an excellent writer that he’s able to make it work fairly well. Even though this was the 4th part, Stallone actually does continue to develop the characters and while they don’t have the same impact they still have plenty of depth. The writing is quite simple, but works well enough and Sly does deliver some very touching moments between the characters. Like I said compared to the first the screenplay does lack, but Stallone still delivers a well written film with very strong characters and this in part helps make up for the lack of story. As director Stallone delivers a very fast paced and entertaining film. I think Stallone does far better than he’s given credit for as well. 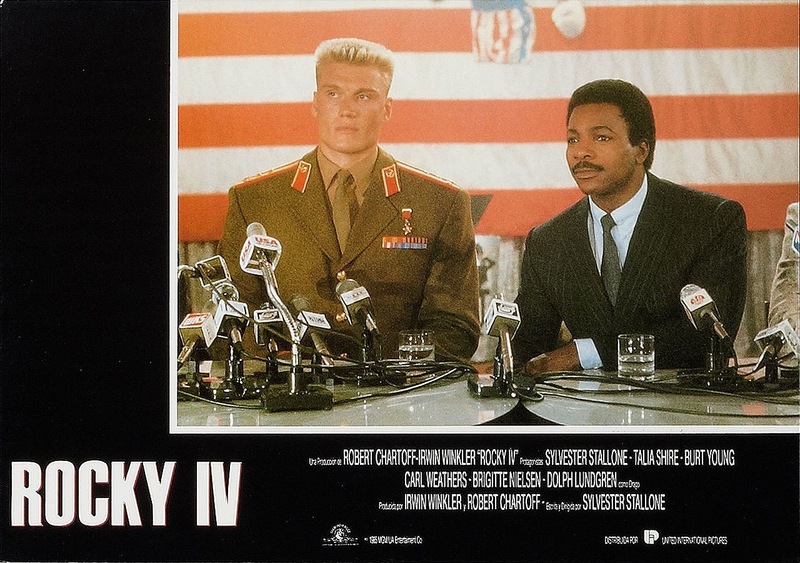 Rocky IV isn’t this deep and complex film like the first two in the series, but it does have a lot more to offer than people realize. I’m a big fan of Stallone as an actor, writer and director and what makes him such a good filmmaker is again he knows what his audience wants and delivers. Honestly had he tried to recreate the original it wouldn’t have worked as well. Instead Sly makes a fun film that is sort of mindless entertainment, but still offers up enough depth to be more than just mindless fun. 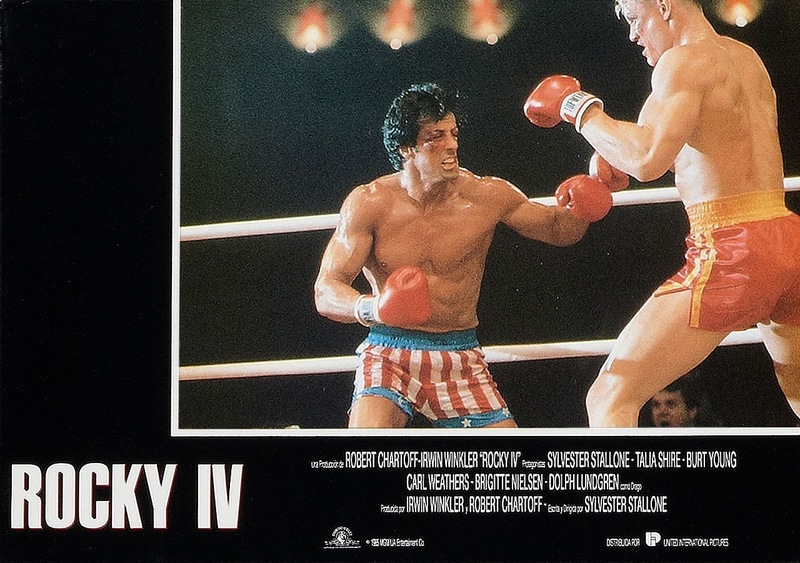 Rocky IV just sort of flies by and Stallone delivers a well made film that is perhaps more enjoyable than it really should be. 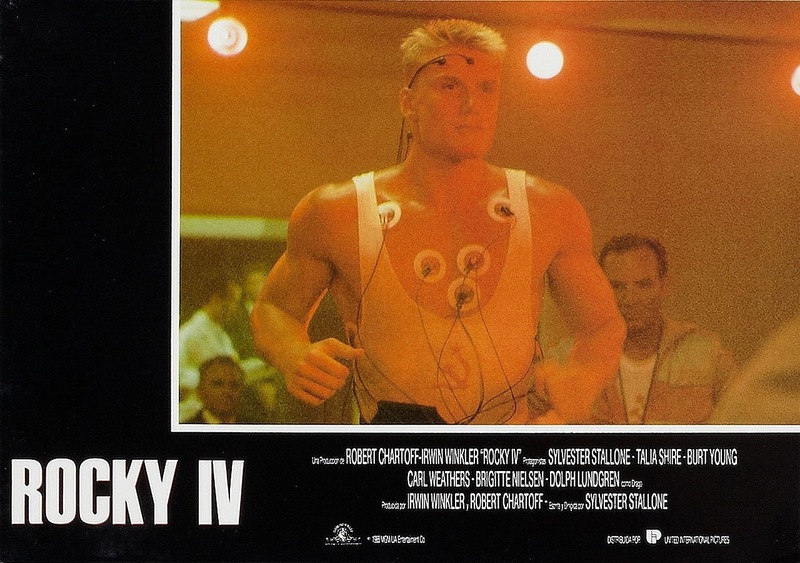 Dolph Lundgren as Ivan Drago was by far Rocky’s most imposing opponent. Dolph has the look, build and height. Dolph is really great here with only limited dialogue, but his presence is all that was needed. 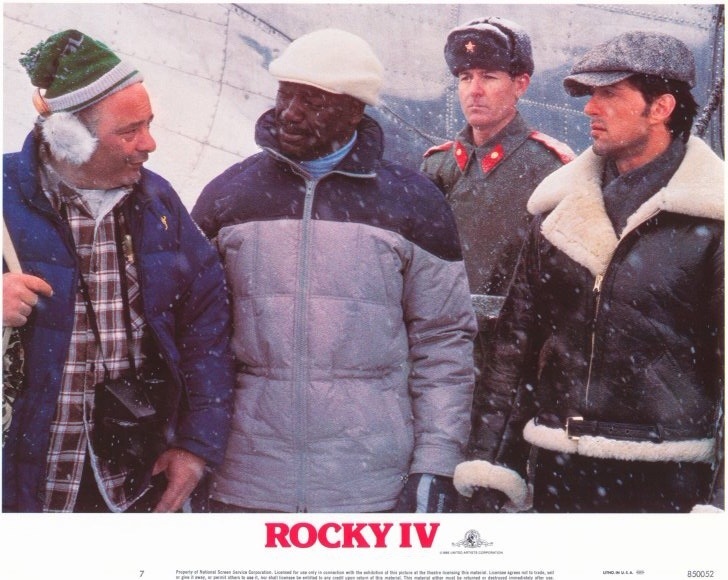 Rocky IV wasn’t his first role, but it is the one that got him noticed and while he enjoyed some success I can’t understand how he wasn’t one of the biggest action stars in Hollywood. I Come in Peace, which also goes under the title Dark Angel is my favorite Dolph film, but Rocky IV is a close second. Like I said he truly has a great onscreen presence and very imposing. 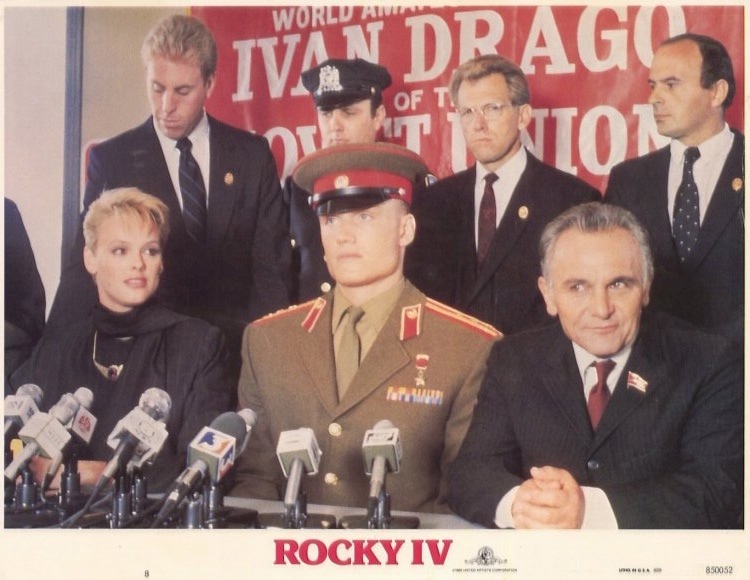 And in someways even Drago is sympathetic as he’s just a tool used to defeat the Americans. Stallone is still giving it his all as Rocky, but is going through the motions just a bit this time around. Burt Young as Paulie steals the show with a truly fun performance. Bill Conti who scored the first 3 didn’t do this film and Vince DiCola takes over. 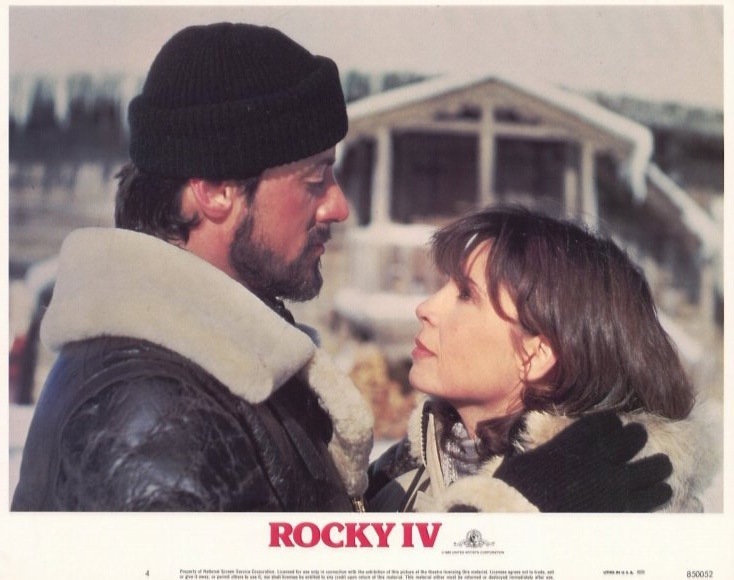 Conti would return for the next two and it is a bit weird watching a Rocky film and not hearing the epic music by Conti, which is every bit as important to the series as Stallone and the rest of the cast. DiCola does use some of Conti’s music with variations and while the score was very good it doesn’t match Conti’s, but DiCola does a fine job. I remember first seeing this and when Hearts in Fire played instead of Gonna Fly Now I was caught totally by surprise and expected another training session. While its very weird not hearing Gonna Fy Now, Hearts on Fire is an excellent song and helps make up for it. 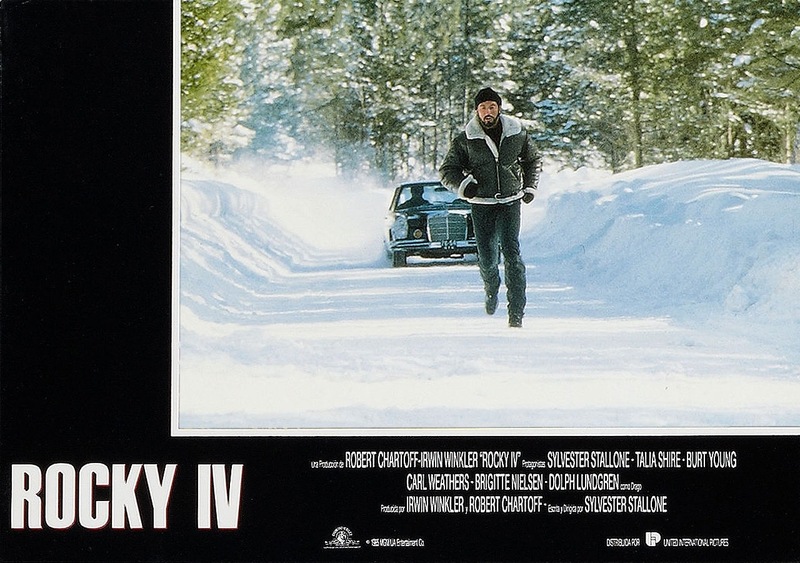 Overall Rocky IV may lack everything that made the original so great, but its just a fun and really fast past film that turns out probably far better than it really should. 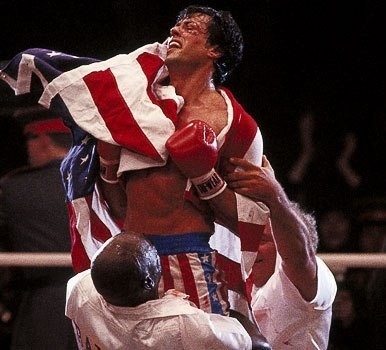 I guess in someways Rocky IV is a guilty pleasure, but like I said its just a fun film and this elevates the film.